May 2016 Employee of the Month! Here at Your Employment Solutions we're in the people business. Our mission is to match the right person to the right job every time. That said, we truly appreciate and care about the people we get to meet and work with on a daily basis. We wouldn't have been voted one of the best places to work in Utah if not for our hard-working and incredible co-workers and employees! We asked Terry to answer a few questions about YES. Here's what he told us. 1. 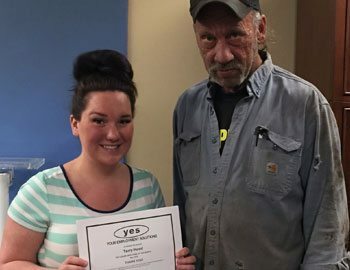 How did you find out about YES? Searching for jobs on the internet. 2. Whats been your favorite job through YES? Robertsons. I get to use my variety of skills and I get a lot of freedom working there. 3. What do you think would make YES better? Nothing. They are fantastic. 4. What would you tell someone looking into working with YES? It’s a good company, I have had no issues. Terry was awarded a thank-you certificate and YES hat for his great work. Thanks again Terry for being a part of the hard-working Logan, Utah staffing team at Your Employment Solutions! We asked Daniel to answer a few questions about YES. Here's what he told us. 1. How did you find out about YES? My father told me about your staffing agency. 2. Whats been your favorite job through YES? I've only had this one job through YES. It's been in quality. 3. What do you think would make YES better? Nothing. Everything at YES is good! 4. What would you tell someone looking into working with YES? YES is a good place to find work quickly. Daniel was awarded a thank-you certificate and YES hat for his great work. 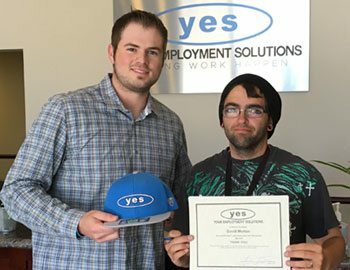 Thanks again Daniel for being a part of the hard-working Utah staffing team at Your Employment Solutions! Madolen was awarded a thank-you certificate and YES hat for her great work. Thanks again Madolen for being a part of the hard-working Salt Lake City, Utah staffing team at Your Employment Solutions! We asked David to answer a few questions about YES. Here's what he told us. 1. How did you find out about YES? My older brother worked with your employment agency. 2. Whats been your favorite job through YES? Innophos. Just the guys I worked with, they were great! 3. What do you think would make YES better? Nothing. You guys helped when other temp agencies couldn't. 4. What would you tell someone looking into working with YES? Absolutely! Do it! Thank you YES! David was awarded a thank-you certificate and YES hat for his great work. Thanks again David for being a part of the hard-working North Salt Lake, Utah staffing team at Your Employment Solutions! Edwin was awarded a thank-you certificate and YES hat for his great work. Thanks again Edwin for being a part of the hard-working Ogden, Utah staffing team at Your Employment Solutions! 1. How did you find out about YES? My cousin referred me to your staffing agency. 2. Whats been your favorite job through YES? Easton. I like the constant workflow throughout the day. 3. What do you think would make YES better? Nothing. YES is already good. 4. What would you tell someone looking into working with YES? YES can find a very great job for you where you can stay and make a career. Andy was awarded a thank-you certificate and YES hat for his great work. 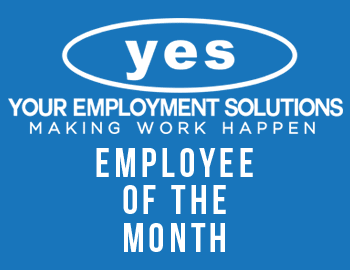 Thanks again Andy for being a part of the hard-working North Salt Lake, Utah staffing team at Your Employment Solutions!